I had my giggles for the morning. I'm working on new magnets. I like the look of stamping the background with script. Now to tell you my problem, I mentioned I was going to show you some more Tattered Tags that I made for Pink Saturday...I took photos, I put the photos in my computer. I was ready to show you....I had a "lightbulb" moment!!! I thought...maybe Jenny at Somerset might like them...so I shot the photos off to her....she loved them and asked me to send them in...so I boxed them up and shipped them off.. She said they would go into their new publication Art Quilts...I'm so excited, but I'm sorry..no photos to show you...I've heard stories about people showing their items, then someone else sends in a knock off, so I'm choosing to keep you in suspense for a few months.lol. I tinkered with this new fabric collage today...a bit at a time, it was so enjoyable watching it come together. It measures 4X7 a bit big for a "tag" but wouldn't it look neat as a tag to a present. I want to make a few more. I just retook this top picture...out doors, it turned out better.lol. This is one of those journals you can pick up for $1.00.I wanted to try out the same technique as I did on the canvas. It worked great!! I'm going to do up a few of these for the sept sale. This is what we got when we went on a country drive this weekend. Duck eggs, they are the most beautiful colors. They are sooo orange...yes, the omelet was de-lish!! The sketch below I gave it a wash of color. It isn't watercolor paper so it was hard to get the color to float. The bird below...is a postcard...I am giving it away...Please sign up on this post. Another sketch below...on watercolor paper. It too is washed out. It is so much fun! Here is my question (I enjoyed the flowers that you all like!!) What bird is your favorite?? I'm trying to sketch a bit each day. I thought I would share a few pages with you. 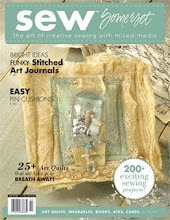 I'm going to be taking another class from Lisa Kaus next mo. I'm think some of these will work using her style of painting. How cute are these little shakers. They have glass bottoms and then you unscrew the old silver part...I've been wanting to make some tassels...how cute will these be? My question for the next giveaway is...do I try to clean them with polish, should I paint them...what do you suggest?? The winner of the Post Card is....Judy from just a little something for you. I'll be offering another giveaway tomorrow!! Last night I gessoed some canvas that I had. I then added Goldens Absorbant Ground. I painted the background and altered the texture of the paint. Then a little rubber stamping, a touch of inking, gel med, glazing med, then the painting of the rose and leaves. I then did some gluing and stitching...made this little pocket, it can hold flowers or tuck a little letter inside. I really like how it turned out. Don't for get my two giveaways...scroll down...one is the postcard and one is the 3 tags. I'll be picking winners tomorrow. 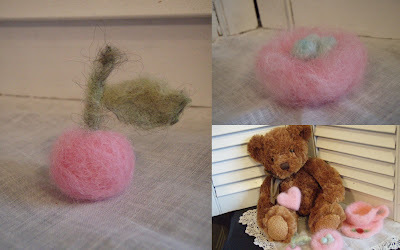 My blogging buddy Diane has these wonderful suggestions "
Also lovely to tuck a gift inside! 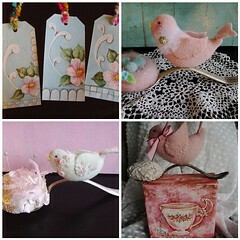 I hand painted these 3 tags to giveaway...acrylics, different pencils, inks, glazing med. Please leave me a comment on this blog...scroll down a bit and there is another giveaway. The news didn't make for a very good lunch. This is a watercolor paper postcard...I altered the front, adding a bit of vintage paper, a little rubber stamping and layers and layers of paint. If you would like to win this postcard, please leave me a comment on this post. rubbed on it. I will pick a winner on Wed. Here is my question. What is your favorite flower?? This little pale green birdie has been on many car trips with me and was forgotten in the bottom of my bird box, so she flew out the other day wanting to be finished. I embroidered around her neck adding little felt flowers, that I cut out with very sharp scissors. The flower is a pretty pale pink. I glittered the pins with Martha Stewart's mint green. I love being a mother! I have the most wonderful Daughter. I know that you all have missed the fact I havent had any drama for 2 weeks now...until today. My husband and daughter (Stacey) took me to Macaroni Grill for Mothers Day We had the best time, the sun was shining, we walked around Bridgeport Village for awhile, we didn't want to go home just yet, when my husband heard a commercial for a car dealership...so we called to find out where it was, not tooo far away. Stacey got a raise at work and knew she was just about ready to look for HER first car...you know the kind...where they HAVE to make monthly payments. She's been saving and was just about ready for the down payment....so off we went, beautiful sunny day (did I mention that already? ?lol) We went to Kia first...we had a discussion on how much the car could cost and how much her payments could be...my husband is very car sauvy so I figured I'd just be in the background and watch the two of them...what fun I had. We ended up leaving Kia after they lied to us. While we were there I called another place, which happened to be right down the road....ummmm they were waiting for us.lol Long story short....Stacey bought her first car after 6 hours, got a fantastic deal, because she stuck to her guns. She found out her credit score was waaay up there (good thing)...any way...I am one proud mamma. I'm glad I'm her mom! Color...Pearly White with all the bells and whistles!! Beverly at How Sweet the Sound always does such a lovely job of getting us to join in the fun. If you want to see other Pink Yumminess go to her blog. I cant visit any Typepad blogs again. I don't know why and I dont know how to fix the problem. Can anyone help me?? Here is a small wall hanging I made today. I have it up for sale over at my ETSY, yep, I said Etsy. lol. My plan is to get these made up for the Sale that I'll be in, in Sept..I'll list a few now and again...if they don't sell, I'll have them ready. ..I learned so much. She is a wonderful teacher, her videos are fabulous. She shares soooo much. This is a wall hanging. I love learning new things. If you can, take the class if you like working with fabric and fibers and doodads this is the class to take! I'm not sure it is finished but it's close. I had a fun day yesterday. I visited Thrift Stores, Fabric Stores, Antique Stores, Art Stores. I signed up for an online class at Lipstick Ranch (I just love that name) and needed a few supplies. I think I'm set...it hasn't even started yet, but I'm ready. I had an old friend (not old as in age ) contact me yesterday saying she wanted to start up a little Mixed Media Group that would get together once a mo. or so. I've been so attached to the computer lately that it would be nice to be with human bodies.lol. 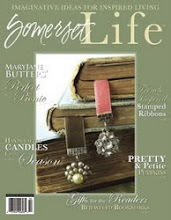 I don't have anything new to share..I've been working on getting goodies sent off to Somerset Life. 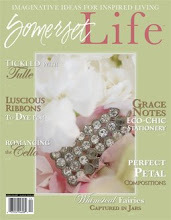 I just received my goodies back that were shown in the latest Somerset. I'll unpack them and get them listed real soon.